Eet je weg in Chiang Mai op een verleidelijke proeverijstocht van 3 uur gewijd aan Thais straateten. Onder begeleiding van een lokale gids, wandelt u 's nachts door de stad, bewondert u verlichte bezienswaardigheden zoals Wat Chedi Luang en zoekt u naar straatknuffelpunten in Chiang Mai. 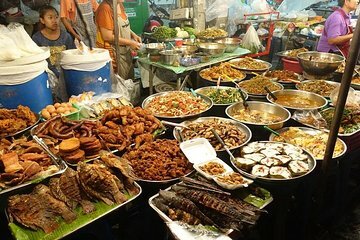 Proef onderweg lokale specialiteiten zoals spiesvlees, Thaise curry en plakkerige rijst, begeleid door vers fruitsap en romig kokosnoot dessert, en koop een drankje in een populaire lokale bar. My guide Amy was fun and very informative. I felt I got a lot more culture and history than I expected, as well as trying some new foods. I was the only one on the tour and it would have been a lot more fun with others, but that’s not really something the tour had control over. This is a great tour! The guide was very nice and sweet. She took us to great food stands all across the city while teaching us about Chiang Mai’s history and food culture. Very present experience, I recommend it to all street food lovers visiting Chiang Mai. Amy was an amazing tour guide and a wonderful person! She showed up early to our hotel and patiently waited for us when we weren't quite ready. She let us try any of the food items we wanted at the market including durian and insects! and gave us an idea of what to look out for when trying street food. We had the opportunity to try durian, insects, pork buns, pork skewers, kao soy, northern thai sausage and more! Throughout the tour she also showed us a few of the temples in the area and allowed us to take tons of pictures while she waited. At the end she also brought us for a complimentary alcoholic beverage at a hidden little bar and gave us the option to stay out for longer if we wanted! Overall it was a fantastic experience and it was great to get to talk to someone as sweet as Amy! Excellent tour, and lovely guide with excellent English. Well worth doing and gets you in the swing of street food and Chiang Mai at night. Defiantly do it! A great way to experience street food without fear of not knowing what you are eating. Our guide had options when some stalls were closed. There is a bit of walking, but that helps digest the food between stalls. The tour goes until about 10pm, so need to keep this in mind if you have young children, but you can always miss the last stop at the bar like we did. a good experience.